Stay positive, stay persistent, stay patient & always pray. High #INRGI (enərjē) is what you get from Dan “Dilemma” Thomas whether it’s in his production, musicianship or DJing. 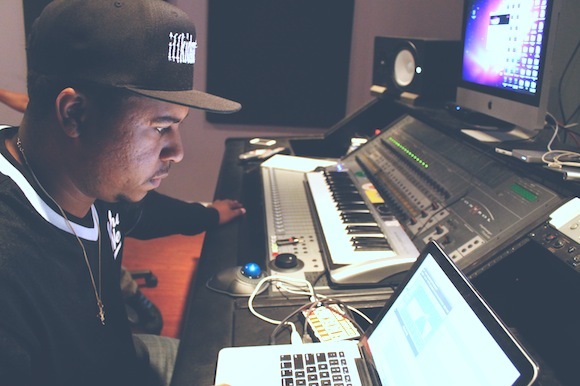 Cultivating his craft at the legendary Sigma Sound Studios in Philadelphia, Dilemma has worked as a producer with artists like Meek Mill, Black Thought, Bizzle, Ray J, Migos, and Jazmine Sullivan on her GRAMMY-nominated project “Reality Show.” His recent work on “Man on Fire” with Def Jam artist, Earl St. Clair charted on Billboard’s Spotify Viral 50 chart. Each record brings a unique mix of energy, hard drums, and memorable melody lines. In addition to his work with artists, Dilemma has also produced for television including TV One’s popular live performance show, “Verses and Flow”and Fox's brand new hit show "The Four: Battle For Stardom". His music has also been featured on Good Morning America, VH1’s Basketball Wives, Love and Hip Hop and in films like “Waist Deep”, "Alien Covenant“, and "McCanick”. His keen ear for music is what puts him at the top of the list for innovative performance DJ artists as he incorporates not only his own production, but samples and his Fl!ps remixes from deep in his bag. From touring with R&B crooner Aaron Camper to ushering in the Democratic National Convention in Philadelphia at the Democratic Governors Association reception, he’s been in high demand. Dilemma has appeared as the DJ/Co-Host on Fuse’s “The Hustle After Party,” traveled the country performing for multiple companies as well as hosting his own DJ performance show entitled #INRGI. This high energy set including live horns has been a feature act across cities including New York, Reading, Austin for SXSW and more. At his shows, you never really know what you are going to get, but you know that it will be an experience. Whether he is DJing, producing or teaching students at The Village of Arts & Humanities, when you hear the “Hello World” at the top of the track, you know that you are now rocking with Dilemma and you are going to hear something that you won’t forget. We wanted to get a little insight into that process so we invited Philadelphia Chapter member and music producer, Dan “Dilemma” Thomas to share some of his top tips when working in the studio with an artist or songwriter. Dilemma is great at what he does and he’s actually making a living from it. In this interview, we discuss how he got into producing music, how he’s been successful at marketing his talents and his advice for aspiring ARTpreneurs. Enjoy. PHILLY 360 PLAYIST: DILEMMA "THE RECIPE AIN'T HARD TO TELL. Philadelphia-based music producer Dilemma put together a unique and creative project over the summer entitled IllKidMaticCity and most recently released the highly anticipated Deluxe Version. Email us [at] info@officialdilemma.com or complete form below. Thank you! Someone from our team will return your email shortly. We look forward to working with you! Get updates, hear exclusive new music, invites to DJ shows, and much more. Sign up and receive a free track download. Thank you for subscribing! Talk soon! Download your track here.